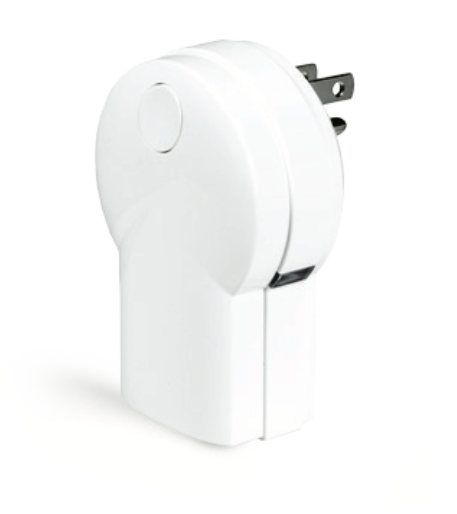 The Plug-in Lamp Module is designed to provide Z-Wave control to a connected dimmable lamp. The PD300Z-2 module is plugged into any standard grounded AC wall outlet, and the lamp is then plugged into the module. Once connected, the lamp can be dimmed or turned on or off remotely via the Z-Wave controller. The module contains two power receptacles – one controlled, and one pass-through (powered at all times). This Plug-in Lamp Module integrates with other Nortek Security & Control Z-Wave enabled products, and can also act as a wireless repeater to ensure that commands intended for another device in the network are received (useful when a device would otherwise be out of radio range). Unique to Nortek Security & Control, the Auto-Sense feature allows for local lamp activation independent of the Z-Wave controller status. With AutoSense, one can simply switch the connected lamp’s manual switch off, then on, and AutoSense will instruct the PD300Z-2 to turn the lamp on.